Judging at a large competition, you get to sample a lot of beers. This year, I judged 6 flights over the two days, ranging from 5 to 12 beers in a flight, with 7 or 8 being the median number (IIRC). Plus, there’s always the “holy crap, you have got to try this” moments when another judge finds a particularly spectacular beer and shares it. And of course, there’s the groans when judges encounter a real stinker. 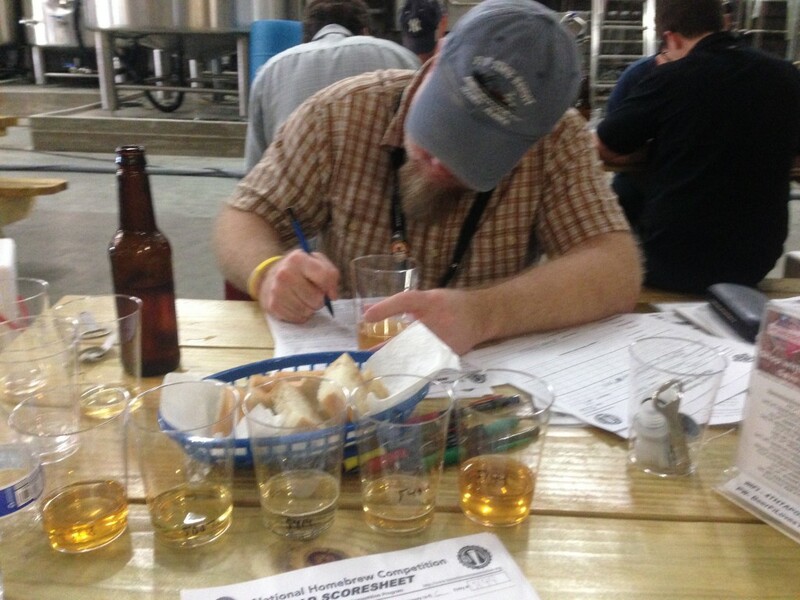 So, each judge gets to sample a fair amount of beer and gets some idea of what the other judges are encountering. On the other hand, one judge’s experience can’t be taken as a statistically valid sample, so these are just my observations. Undercarbonated beers do not produce a nice foam stand. In addition, the intensity of the beer aroma is lessened because carbon dioxide bubbles aren’t pushing it out of the glass. Finally, a small amount of carbon dioxide in beer dissolves and becomes carbonic acid, which gives beer a bit of “liveliness” (due to a slight drop in beer pH). If you’re entering a homebrew contest, get your carbonation levels right. If you don’t you’re losing easy points and potentially making the good parts of your beer harder to detect. 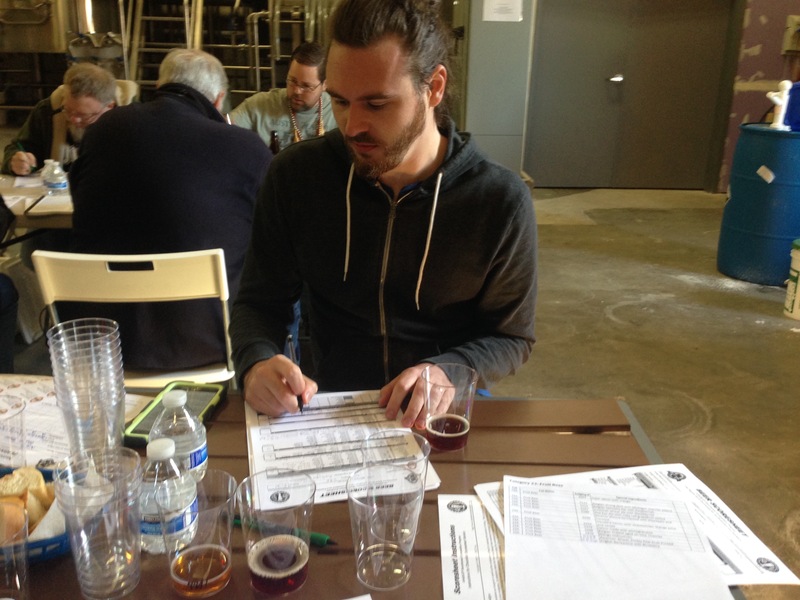 Judging fruit beers with Dan Ironside. I was shocked at the number of contaminated beers I encountered this year (both in my flights and from the descriptions of other judges). 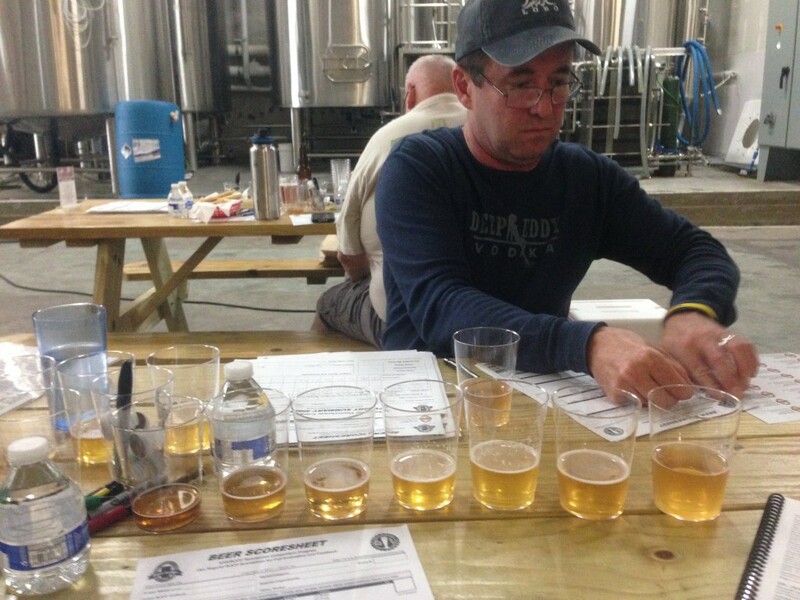 I encountered a number of beers that were so awful I couldn’t believe anyone would submit them to a contest. Afterwards I wondered if this might have been a problem at bottling. The brewer’s keg of beer might have been fine, but maybe he or she didn’t pay enough attention to sanitation while bottling. It could be that I just drew more than the usual number of bad beers this year. I did taste some very good homebrews as well, but the numbers seemed to be down. In commercial brewing, many brewers and beer experts think the average quality of beers is declining. The best brewers are still making great beer, but much of the beer being made at start up breweries is substandard. Could the same thing be happening among homebrewers? To really find out, we’d need to see if multiple judges encountered the same thing as I did (and maybe if scores are in decline this year). More importantly, experienced homebrewers should reach out to younger brewers who may be floundering a bit and help them understand what separates good homebrew from bad. Judging mead with Eric Lowe. Want to know something about mead? Ask this guy.